Religious censorship in Egypt with no explanation. Last October, I wrote about the case of Karam Saber, an Egyptian writer who was sentenced to five years in prison for “contempt- and defamation of religion” in his short story collection, Where is God. On March 11, the Beba Misdemeanour Court in Beni Sueif upheld this sentence. 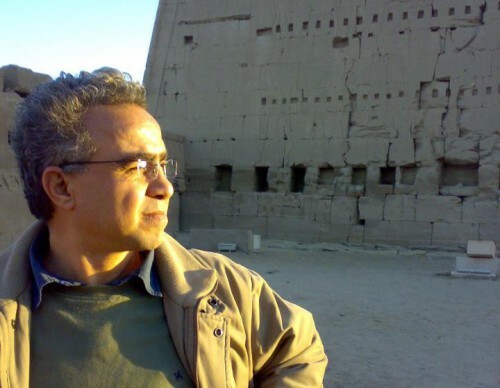 Karam Saber is also a lawyer, and described his sentence as “shocking.” He pointed out that the constitution prevents the imprisonment of people for their creative work. His prison sentence relied on reports from Al-Azhar and the Beni Suef diocese. Both condemned the short story collection, asked that it be withdrawn, and called for Saber to be punished. Unfortunately, the court has ignored the constitution and the article that forbids imprisoning writers and creatives. The court has also ignored the literary reports that were issued by the committee of the the Egyptian club of story (Nady El Kasa). The Committee praised the collection and said that the next court session will be Sabar’s last chance, but if the appeal is rejected, he’ll be imprisoned. “We live in a climate of anti-creativity where every week the Islamic Research Institute of the Al-Azhar withdraws one or more books in a single session. And not every withdrawn book is disclosed to the media. I also know that the author of a banned book cannot even have a copy of the report issued against his book. “This is what happened with my two part book, Al-Wasaya fi Eshq Al-Nisaa. The first part was published in 2003, and the second in 2006. The Committee issued their opinion about me and my book, which they didn’t read at all. In addition, I didn’t get an official copy of that report, but had to procure it from religious editors. Why does the creative person get punished without having his book read or being told why? 4 Comments on "The Defamation of Religion and Karam Saber, Again"
The contempt of religion and insulting the religious beliefs of behavior criminalized by national laws and is anathema to international documents and may not be to say that we are passionate too much and we have a contract psychological make us reject compromising beliefs and is also true that European countries in favor of cash and encourage freedom without restrictions , these states passed laws prevent the defamation of religions . It has issued a General Assembly of the United Nations several resolutions on combating defamation of religions and urging tolerance and respect for the heavenly religions and so starting in 2006, with a decision by the General Assembly of the United Nations No. 60/150 , issued on Jan. 20, 2006 on combating defamation of religions and the decision of the General Assembly United Nations No. 61/164 of 21 February 2007 on combating defamation of religions and the decision of the General Assembly of the United Nations No. 62/154 , issued March 6, 2008 and the decision of the General Assembly of the United Nations No. 63/171 , issued on March 24, 2009 on combating defamation religions and the decision of the General Assembly of the United Nations No. 64/156 , issued on March 8, 2010 on combating defamation of religions and the decision of the General Assembly of the United Nations No. 65/224 , issued on April 11, 2011 on combating defamation of religions, and therefore the General Assembly of the United Nations have issued six resolutions against defamation of religions from 2006 until 2011 . Included texts of the International Covenant on Civil and Political Rights is urging respect for beliefs and religions and not to stir up hatred and anti- hate calls and sectarian strife or religious racism that constitutes incitement to discrimination , hostility or violence . The view that the novel where God Karam Saber creativity or expression of freedom it is mixing between creativity and fads . That creativity is all that transcends human beings and not airing it and come down to the idea of ​​sense to the levels of a bear , and the contraptions are based on misinformation and confusion and wasted values high , and ridicule religions symbols , that wasted religious beliefs that are security fencing for a person not less harmful for indecent publications which prevents the display of the balance and the protection of creation, that those who support and encourage creativity, imagination can not deny that there are valuable moral to be taken into account and not historical facts may be distorted . Unfortunately it is the prevalence of fraud and naming things without denominations has become slander and cash lying Tgmla, hypocrisy, fraud ploy and intelligent and delightful attack on the holy sites of the basics of thought and culture until it became naming things other than what they need for life and an urgent need for the vaunted Scientific and Cultural dealers speech and vendors of deceit and media artwork. The ordinary people are stung by fire and these lie Alavaqan until they became like the straw in the wind-driven minds of Osmoa themselves (b elite critics and writers) Vsaroa Ihrcnhm as they wish in any terms they want ..!